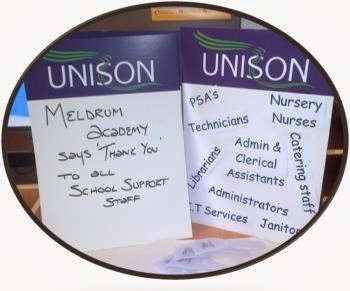 On November 29th Meldrum Academy, working in partnership with UNISON, celebrated all School Support Staff. During the day both teaching staff and pupils thanked and praised the work that support staff undertook to enable and enhance the learning experience of the pupils. A special break time treat was put on for all the staff and tea and coffee was served by some of the senior pupils. Meldrum’s Head Boy told the staff how invaluable the support staff were in the school and that in-class support was very much appreciated and has benefited many pupils at the academy. Susan Kennedy, Assistant Branch Secretary said, “I would like to thank all the staff and pupils who have made today’s celebration a success. “We need to highlight the importance of school support staff and work together to protect their roles within Aberdeenshire schools. Next Post:Branch to review policy on the administration of medications by PSAs at AGM in Feb. Come along and have your say.